The Third Revolution argues that Xi Jinping’s dual-reform trajectories—a more authoritarian system at home and a more ambitious foreign policy abroad—provide Beijing with new levers of influence that the United States must learn to exploit to protect its own interests. Read an excerpt from The Third Revolution. Characterized by “a reassertion of the state in Chinese political and economic life at home, and a more ambitious and expansive role for China abroad,” Xi’s China is exercising “new levers of influence and power that others will have to learn to exploit and counter to protect and advance their own interests,” warns Economy, C. V. Starr senior fellow and director of Asia Studies at CFR. “An illiberal state seeking leadership in a liberal world order,” China poses a set of distinct new challenges for the United States. Xi “seeks to project the current Chinese political and economic development model globally,” and to “become a standard bearer for other countries disenchanted with the American and European models of liberal democracy.” While China “takes advantage of the openness of the United States and other market-based liberal democracies to further its economic interests and advance its political and cultural influence,” it “increasingly constrains opportunities” for other countries to do the same. “The United States . 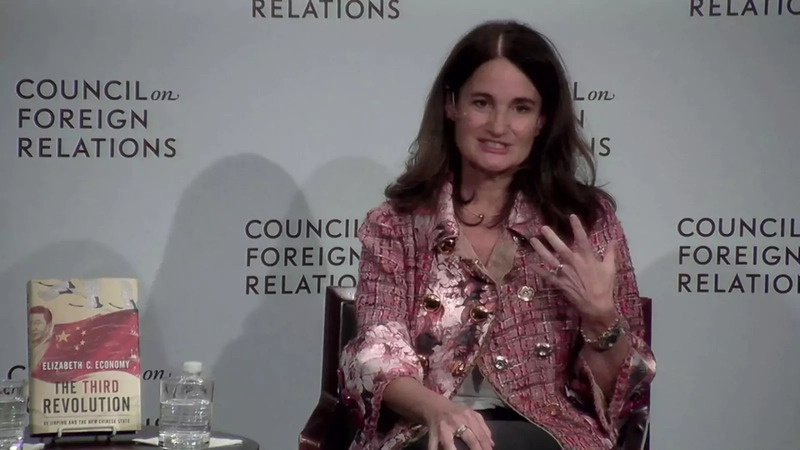 . . must continue to seek opportunities for cooperation but at the same time be prepared to counter and confront China when Xi’s Third Revolution spills over into the rest of the world, undermining the principles underpinning global security and prosperity it purports to uphold,” she writes. Leverage Xi’s ambition for leadership and “[encourage] China to do more on the global stage,” such as addressing the global refugee crisis and ensuring that its global development strategy, the Belt and Road Initiative, adopts better governance practices. Work with U.S. allies and partners in Asia and Europe to support the underlying principles of a “free and open Indo-Pacific, rooted in a rules-based order” by revisiting “U.S. participation in the [Trans-Pacific Partnership],” deterring “further efforts by China to realize its sovereignty claims through unilateral actions” in the South China Sea and Taiwan, and developing “programs that build good governance capacity” such as the rule of law, in countries such as Ethiopia and Pakistan, where Chinese political influence is expanding. Prioritize U.S. government support for the “development and adoption of new technologies” to compete effectively with Made in China 2025 and other innovation-driven industrial policies. “China cannot be a leader in a globalized world while at the same time closing its borders to ideas, capital, and influences from the outside world,” Economy concludes. Educators: Access Teaching Notes for The Third Revolution. The must-read book of 2018. . . . Economy's book traces Xi's influence and ambitions through an exhaustive reading of his speeches as well as an astute knowledge of Chinese politics and policy. It should be required reading not just for China-watchers but for anyone interested in U.S.-China relations and the future of world order. This panoramic evaluation is as thorough as it is balanced and should be core reading for anyone looking to understand how Xi’s revolution is transforming China. This work is thoughtful, balanced and highly analytical. Economy has successfully produced a book that appeals to all interested to learn about China under Xi Jinping. . . . Economy is at her best in analysing Xi’s China for what it is and putting forth constructive ideas for the US to engage it without giving up its core values. The book is accessible and well written. In the months since I purchased the book, I found myself returning to it, while other books have languished unfinished on my nightstand and coffee table. The Third Revolution probably is the first book I would recommend someone read to understand what happened in China during the last five years. Economy’s marvelous new book The Third Revolution: Xi Jinping and the New Chinese State is an example par excellence of both the breadth and the depth of her China knowledge. . . . For anyone seeking a well-informed, well-researched, up-to-date 'one stop shop' on China in the Xi Jinping era, this is it. A thorough and informative account of China’s recent past and present. A compelling book. . . . Economy has written a thought-provoking and thoroughly researched analysis of the CCP’s pervasive influence throughout Chinese society and politics. She convincingly demonstrates how Xi’s dismantlement of liberal elements of the past three decades, including growing freedom of speech, market economic mechanisms, and enhanced international exchanges, has consolidated the party as an indispensable structure influencing all aspects of Chinese life. Economy investigates these ongoing transformative changes in China not as a disinterested academic but as an acutely involved policy analyst concerned with understanding the 'seeming inconsistencies and ambiguities of Chinese policy today.' . . . Economy’s deep knowledge, insightful analysis, and engaging style of writing make The Third Revolution a highly rewarding read for anyone who wishes to understand the contradictions and paradoxes in the political, economic, and social trajectories of Xi’s China. The Third Revolution is a welcome addition to the still-emerging literature on China’s problems. . . . Deftly covering a huge range of issues familiar to those who keep up with news from Beijing, Economy has in essence crafted a handbook on contemporary China. . . . Economy should be lauded for her clear-eyed, sober assessment of a China that is not the country many believe or wish it to be. . . . Avoiding surprise in dealing with China is perhaps the most important goal of U.S. policy, and The Third Revolution goes a long way toward reaching it. A timely account of how Beijing is expanding its influence makes for sober reading. How should observers, especially those in Washington, assess Xi’s China? 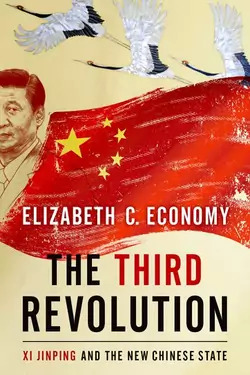 In The Third Revolution, Elizabeth Economy offers a nuanced, persuasive answer: while China’s heft in world affairs is growing rapidly, so too are the contradictions inherent in the attempt of an authoritarian country to shape what remains a predominantly liberal world order. Economy . . . offers an engaging look at how areas such as internet regulation, reform of state-owned enterprises, and foreign policy are evolving under Xi’s leadership. Economy begins by meticulously tracing Xi’s ascent to the top of the Chinese political system before delving into the policies that he has espoused in pursuit of expanding China’s national power. . . . The advice that Economy, therefore, offers actors in the international arena is to focus not just on China’s foreign policy but also its domestic affairs. It is only then that one can frame appropriate policy responses towards a nation whose rise is undoubtedly re-shaping our world. To understand and navigate China in the coming years, this is the book to read. At the heart of doing business in this opaque and contradictory country is understanding Xi Jinping, a masterful and complex politician. Elizabeth Economy’s exceptionally clear account gives you the tools to do just that. The Third Revolution is enormously valuable for anyone seeking to understand the ways in which China is changing (and not changing) under Xi's leadership, and how the U.S. should best approach its relationship with China. Essential. The one book that tells you all you need to know about how China has changed under Xi Jinping. A clear-eyed, richly researched, and engaging account by one of America’s most knowledgeable China experts. A timely and sobering analysis of the profound—and disturbing—political change that has occurred since the rise of Xi Jinping. This is by far the most insightful and illuminating study of China’s new political landscape, and should be required reading for those concerned with China’s future under strongman rule. Elizabeth Economy provides a clear-eyed net assessment of China under Xi Jinping: its global ambitions, domestic limitations, and the paradox of its external hubris and internal insecurities. The Third Revolution should become staple reading for all who want to understand China today and where it is headed in the future. Americans are slowly realizing that they live in a bipolar world with China, a nation that is incontrovertibly rising despite the destabilizing effects of serial self-reinvention. The advent of the latest progenitor of rejuvenation, Xi Jinping, has raised a host of vexing questions, but Economy's wonderfully lucid and well-researched book fills in many of the blanks regarding Xi’s strengths and weaknesses. For the first time in modern history, we have a communist country poised to be the biggest and most important driver of the global free market. That’s astonishing. And we still don’t know what makes China’s political leadership—and Xi Jinping in particular—tick. If that freaks you out (and it should), Liz Economy’s book is the place to start. Jaw-Jaw: Will Xi's Third Revolution Last?